This walk: 2015-5-6. Fernworthy Forest, hut circles, slotted gatepost, Lowton Brook West settlement, Assycombe stone rows, cairn, cist, Assycombe Brook settlement, Asacombe Farm, Sitka spruce cones. Previous walk in this area: 19th January 2011. Many of the photographs below were taken on a "recce" on the 30th April 2015. The archaeology of this area is described in The Archaeology of Fernworthy Forest, Dartmoor, Devon: A New Survey, Phil Newman, July 2013, South-West Landscape Investigations. Feature built onto the hut wall, at the far left in the photograph above, reminiscent of an oldtime meat safe (we had one). A waymarker along the way. Identifiers on a fallen post. A glimpse of Fernworthy Reservoir through the trees. This seems to have been deliberately cut, it is about 40 years old. The stone row is described by J. Butler (1991), Dartmoor Atlas of Antiquities Vol. 2 - The North, 35.19 - Asacombe Hill stone rows (fig. 35.10), page 166. This double row is similar to its neighbour on Hurston Ridge, a kilometre to the east. There were an original 144 stones with only eleven now missing. It is possible that one blocking stone has been removed, as there is a peaty depression where it might have stood. It is also possible that a third row was planned but never installed, because the rows do not align well with the centre of the cairn. Another view ..... this hut is part of the Assycombe Brook settlement (over the ridge from the Lowton Brook West settlement), and is described by Jeremy Butler (1991), Dartmoor Atlas of Antiquities Vol. 2 - The North, 35.5 Assycombe Brook settlement, page 157. It is 8.1 metres in diameter and less than 3 metres from the rows. Hut circle - this is about 100 metres below the end of the stone row, at SX 65930 82458. Another hut circle, at SX 65893 82668. Hut circle at SX 65895 82846, just a few metres to the left of the farm house when looking at it from the road - strange that such an ancient Bronze Age structure should survive so close to a modern dwelling ..... the movie shows this to be a large hut within and still-substantial enclosure. Towards the end of the movie, the remains of Asacombe Farm and it's upright stones are seen over to the right. Panorama showing a large hut circle inside a substantial enclosure, with Asacombe Farm over to the right. Small bridge over Assycombe Brook. The non-scented Common Dog Violet (Viola rivianna) with flowers similar to the scented Sweet Violet (Viola odorata). 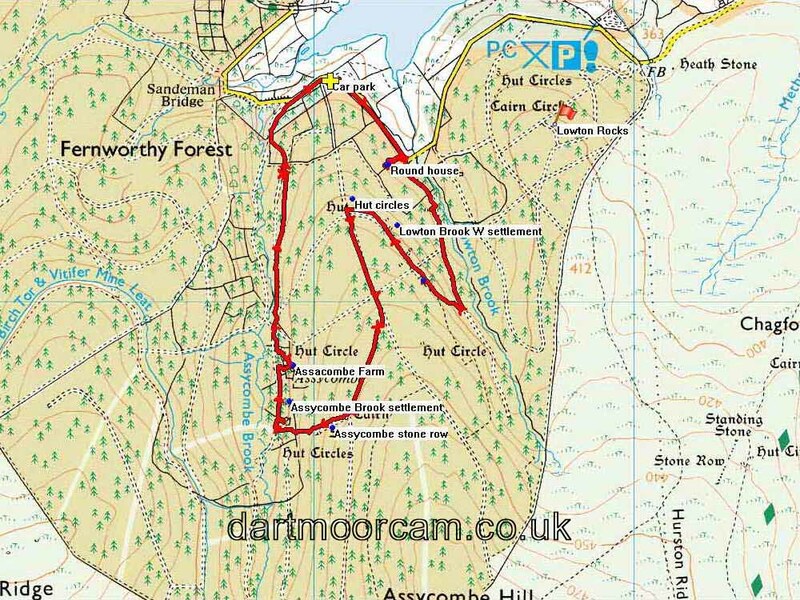 This walk was reached from the B3212 road running from Postbridge to Moretonhampstead, turning north after the Warren House Inn to Jurston, Tunnaford, and then to Fernworthy. Pay & Display parking is available at the entrance to the forest where there are other facilities (see map), by the storage shed (yellow cross) or at the extreme end of the tarmac road. Distance - 4.09 km / 2.54 miles.